Nothing says spring like a delicious Mango Lassi! 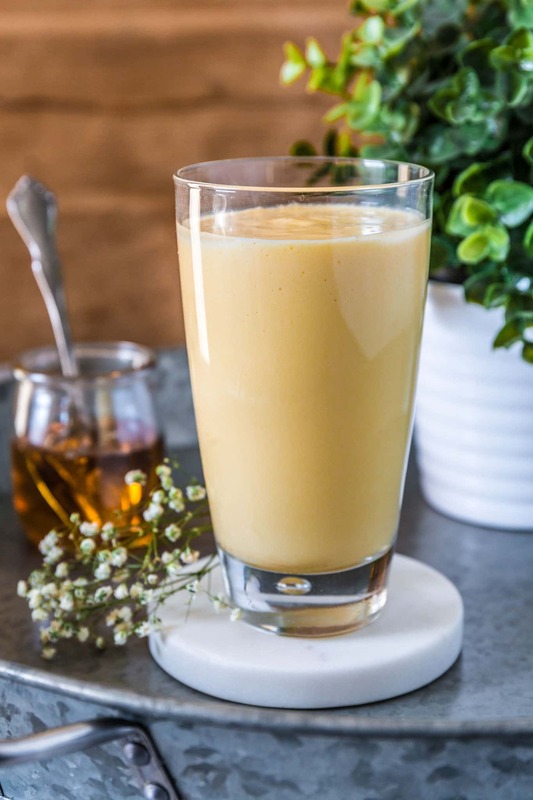 This popular yogurt-based Indian drink is like a mango milkshake that you can have for breakfast. My first Indian recipe ever here on the blog! Can’t deny I’m a little nervous about being adventurous. I’m not very familiar with Indian cuisine and have only attempted to cook it once or twice. But when I recently tried a Mango Lassi for the first time, I thought it seemed easy enough for me to try to make it at home. Not to mention, easy to make. Because what could be easier than throwing 4 or 5 ingredients in the blender and letting technology do the work for you? ? Many people are familiar with Mango Lassi but don’t know that in India Lassis come in a variety of flavors and styles. They usually use whatever fruit is in season to make a sweet drink to accompany spicy foods. The cardamom is optional but I find that its flavor and fragrance really makes this lassi different than a regular mango smoothie. Just a pinch, though, as the predominant flavor should be the mango. As for the mangoes, I like to use Nature’s Touch Organic Frozen Fruit. I like using frozen fruit because it makes it super cold without you having to add ice, which waters it down. Not to mention, they are available to me year round! My product of choice? Nature’s Touch Organic Mangoes or Nature’s Touch Pesticide-Free Mangoes! Whenever I visit my local ShopRite, I never leave without their mangoes. They are just that good! Nature’s Touch Organic Mangoes are grown in Mexican and Peruvian lands, where the tropical weather and soil are just right for growing luscious, big, tasty fruits. They harvest the mangoes at the peak of flavor, when they are perfectly ripe, and that’s how they arrive at your home. Just like nature intended, without any additives or preservatives. Nature’s Touch also carries other tasty frozen fruits and vegetables and their goal is to make eating real food as simple as can be! ❤️ You can find both their frozen fruits and vegetables at ShopRite and Shaw’s and their frozen vegetables at Big Y.
I always have a bag of frozen mangoes in my freezer, as I can never get enough mangoes. I add them to my smoothies, desserts, salads, chicken dishes or I just process a handful into “ice cream”, ‘aka’ perfect healthy pregnancy guilt-free treat! This Mango Lassi, though, is definitely my spring jam. I’m not even ashamed to say that I’ve made it several times over the course of a month. What can I say? I love mangoes and I love refreshing drinks. Oh, and I’m slowly falling in love with Indian cuisine! ? However, even if you’re not a fan of Indian cuisine – or simply not familiar with it – you should definitely give this a try. I guarantee you’ll be making it over and over again to cool off during spring and summer. Want to show off how you “Get a Taste of Adventure?” Check out the image below for details on how you can win some incredible prizes from Nature’s Touch (like a trip to Chile and a visit to a farm where Nature’s Touch sources its fruits and veggies)! Head over to www.NaturesTouchContest.com for additional info!